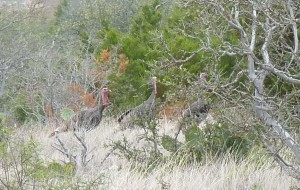 The Rio Grande turkey is the most common of 3 sub-species of wild turkey found in Texas. Their numbers in the Edwards Plateau have actually declined since the highs of the 1980s but appear to have stabilized over the past 2 decades. Current statewide population estimates from TPWD put the number of birds statewide at about 500,000. That sounds like a lot but compare it to 3.8 million whitetail deer in Texas. Wild turkeys on average only live 2-3 years but some individuals have lived to be 10 years of age. The three most critical components of good turkey habitat are roost sites, nesting cover, and brood habitat. Roost sites in the Edwards Plateau are most often associated with drainages where larger trees grow due to higher moisture availability. Good roost trees have spreading horizontal branch structure and fairly open canopies that allow the birds to fly into the trees. The majority of roost sites on the ranch are large oak trees. Good roost sites also have open approach areas where the birds can detect any predators before they go to roost. It is critical not to disturb birds at the roost sites as they will abandon them with continued disturbance. It is also illegal to hunt turkeys on the roost in Texas and most states. The most critical element in good nesting cover is tall grasses, approximately 18 inches in height. Most nests will be found in grasses near the base of some type of shrubby cover. One Texas study reported that 87% of all nests were in this type of grass cover. Most hens nest within ¼ mile of a water source. Recent studies in Texas have shown that only 1/3 to 2/3 of hens will actually try to nest each year depending on the weather and habitat conditions. Each hen will lay an average of 9-11 eggs with up to 16 reported over a 2 week period. She will then incubate the eggs for 28 days until they hatch. A maximum of only 30-40% of the nests will be successful in hatching. The rest will be lost to weather or predation events. The first 2 weeks of a poult’s life are also characterized by high mortality losses to a variety of causes. The poults immediately begin foraging on their own under the watchful eye of the hen. Semi-open grassy areas with high bug populations and nearby overhead cover provide good brood habitat in this stage of their life. After 2 weeks the poults can fly and will begin roosting in trees substantially increasing their chances for survival. Out of an average of 8-10 poults hatched from a nest only 2-3 are usually still alive at the end of the summer. The point here is that becoming an adult turkey is not a high percentage game for young poults even if the eggs do successfully hatch. Once fully grown, turkeys are primarily herbivorous but will still take insects and other invertebrates. A large variety of grass seeds, fruits, nuts, and forbs make up the majority of their diet. Under severe conditions supplemental poultry feeds do seem to benefit turkeys but will not make up for poor natural habitat conditions. Good habitat in a mosaic of open and wooded cover with available water will provide everything a turkey needs. Most recommendations suggest a 50-50 mix of open areas and brush. Some more recent research and my experience is that 30-40% seems to be sufficient. Brush is all species, not just juniper (cedar). Juniper berries are eaten by turkeys but heavy brush cover will deter turkey use since their primary defense against predators is their eyesight. Two good publications for information are “Rio Grande Wild Turkey in Texas, Biology and Management” by the Texas AM Extension Service (publication number EB-6198, a free download), and “Texas Turkey Talk” by TPWD ( a free 14-page PDF booklet).